Posted on December 6, 2018 at 6:00 pm. Under the agreement, Sun Tribe Solar will install solar arrays, similar to the ones at Discovery Elementary School, on five schools. Arlington, VA—Arlington Public Schools (APS) today announced that it has signed a contract agreement with Sun Tribe Solar of Charlottesville, Va. to install rooftop solar panels on five schools across the county. Under this solar power purchase agreement, Sun Tribe Solar will install solar photovoltaic (PV) panels at Alice Fleet Elementary School (now under construction), as well as Tuckahoe Elementary School, Thomas Jefferson Middle School, Kenmore Middle School and Washington-Lee High School. 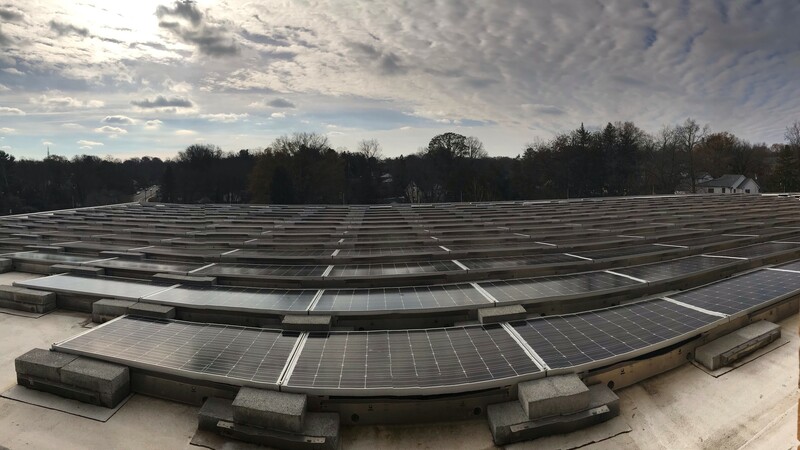 The schools’ solar PV system will include 6,980 panels with a total capacity of 2.5 megawatts of power, making it the largest overall solar power installation at any school system in Northern Virginia. The solar panels will be owned by Sun Tribe Solar and installed at each of the sites at no upfront capital cost to APS. Throughout the 25-year contract term, Sun Tribe Solar will operate the solar arrays, selling 100 percent of the solar power produced to the school division at a rate below the cost of electricity from the local utility provider. APS will save an estimated $4 million in electricity costs over the contract term. The five projects will expand APS’s renewable energy portfolio, which includes solar PV arrays already in place at Discovery Elementary, a net-zero school completed in 2015, and Wakefield High School. At Discovery, the solar PV array now generates more power than the school needs, making it “net-positive” and providing the opportunity to share power with neighboring schools. Glebe Elementary and Kenmore Middle School have solar PV array demonstration systems as part of the Solar to Schools Program. The solar PV arrays will be equipped with an Energy Dashboard, allowing students to interact and learn about the impact of solar on their school and community. Like Discovery Elementary School’s Energy Dashboard, APS will have the opportunity to integrate the panels into instruction at each school and create experimentation learning spaces for students. The process to expand solar power at the five schools was initiated through an RFP in December 2017. Sun Tribe Solar was selected based on the strength of the company’s reputation with similar installations, as well as its site designs, operations plan and engineering and financing approach. The panels will be installed beginning in May 2019 and will be fully operational in the 2019-20 School Year. Once the 25-year contract term is completed, the schools will have the option to purchase the panels at their market value at that time. For more details on the agreement, click here.